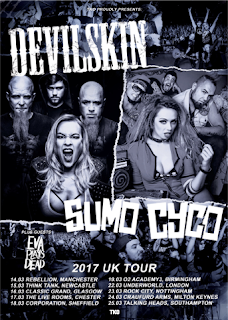 DEVILSKIN follow a hugely successful joint headline tour accompanying their friends HALESTORM and DISTURBED, with the announcement of a 10 date UK co-headline tour alongside SUMO CYCO in March. 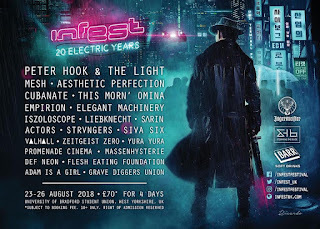 DEVILSKIN will tour their explosive live set throughout the UK, starting on March 14th in Manchester, including the Underworld in London on Wednesday 22nd. Sumo Cyco! 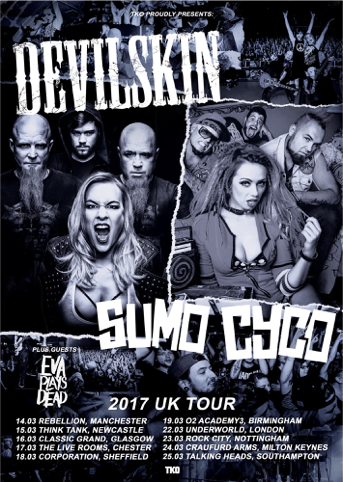 The response from our UK friends has been overwhelming and we can't wait to unleash the new tunes live.The audience are in for a really special evening of high octane rock, Sumo Cyco bring the party, we are beyond amped for these shows. Bring it on!"